Nice photo. On the left is Daniel Gowing and on the right is Ben. Ben, Daniel and Aaron Page are the last survivors of University Judo Club's early 80s young men's squad. Who have all been 'on the mat' for more than thirty years now. Daniel was an outstanding contest player. He went to two Olympics and at one point he was seeded 9th in the world in the Men's Heavyweight division (Under 100kg). In Big Judo's opinion he is one of New Zealand's top half dozen Judoka. Lots of Judo players get to international level by being good at stand up fighting. Some get there on the strength of their ground game only a few are excellent at both. Daniel was one of those. Ben fought in the same weight division as Daniel so 'learnt' a lot of his Judo from being beaten by Daniel. Daniel is an engineer and has been working in England building wind turbines. He recently came back to New Zealand and this photo was taken when he visited University Judo Club. It was great to see him again. On 22 September 2013 Howick Academy of Judo is sponsoring a day of social contest at the Howick Community Centre. The first part of the day is devoted to kids competition and Big Judo is planning to take a team to the contest. This will be a fantastic opportunity for the kids to have a go at competitive Judo. The kids will compete in the 'Pee Wee' Division that is for kids starting Judo. It will be great day and Ben and the other 'Big Boys' from Big Judo will also be there to coach and support the kids. Judo on Monday at the Police was fun - for Ben. Not so much fun for the team. Ben has been teaching 'taking and holding the back'. Unfortunately for the team it means a fair bit of lying down while Ben sits on you. We have been teaching Rick's 'Old Skool' University 'double hook' then immediately attack the neck with a grinding strangle followed by a series of attack - counter - attack movements from the same position. Ben squashing a poor volunteer while demonstrating. 16 August: We had 18 kids and six Seniors. We love teaching Judo and are really excited about getting such a fantasitic response. Thanks heaps to all the people that have supported us so far. 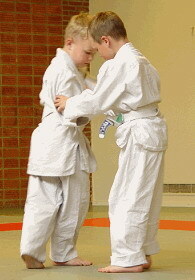 Big Judo's Third Term got off to a great start on 3 August 2013. We had plenty of kids who were all ready to go! After a bit of revision we got down to business and the kids fought some epic 'battles'. All in all it was a pretty good start to the third term. Kids lined up as we revise technique. An epic battle in progress. In action. Disciplined mayhem as the kids wrestle and practice their skills.